Multiethnic, war-ravaged, historic and naturally beautiful are fitting descriptors of the former Yugoslavian nation, Bosnia & Hercegovina. 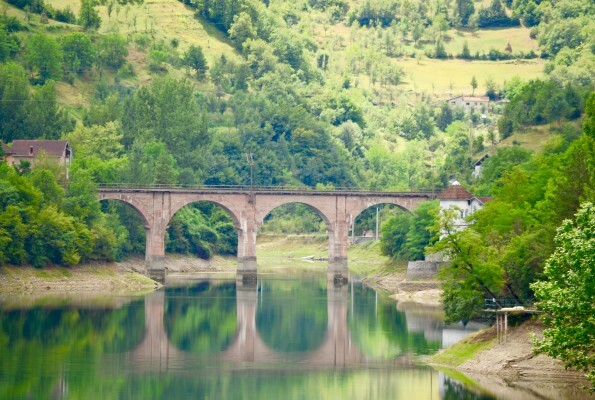 This Balkan country has been in the news for mostly war and war-related incidents. But my travel through Bosnia (Travnik, Sarajevo, Konjic, Mostar, and Balgaj) unfurled impressions beyond those depicted in mass media. Travnik was once the capital city of the Ottoman empire. 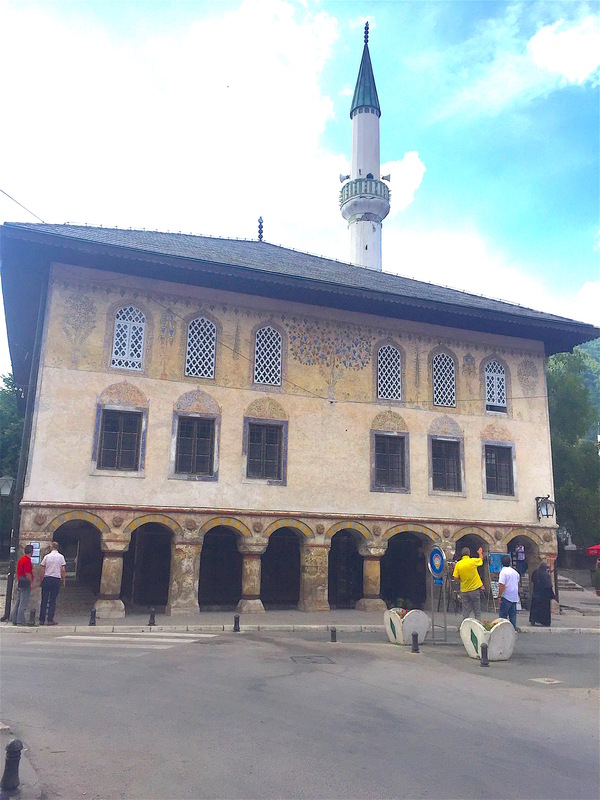 The Jeni Mosque in this town is the oldest building from the Ottoman period. 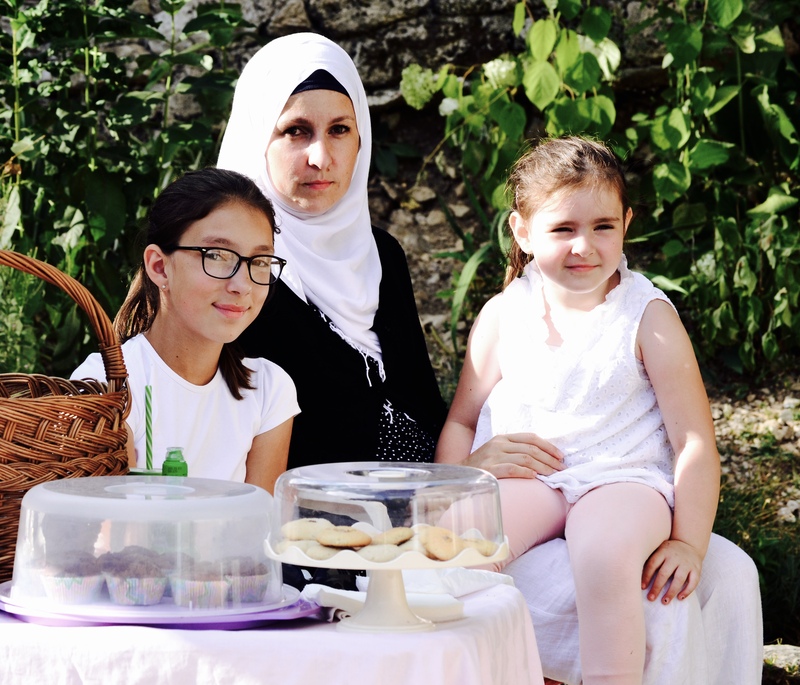 A mother and her two daughters raising money for their school through the sale of homemade biscuits, cupcakes, and popcorn at, Plava Voda, (Blue Spring), Travnik. 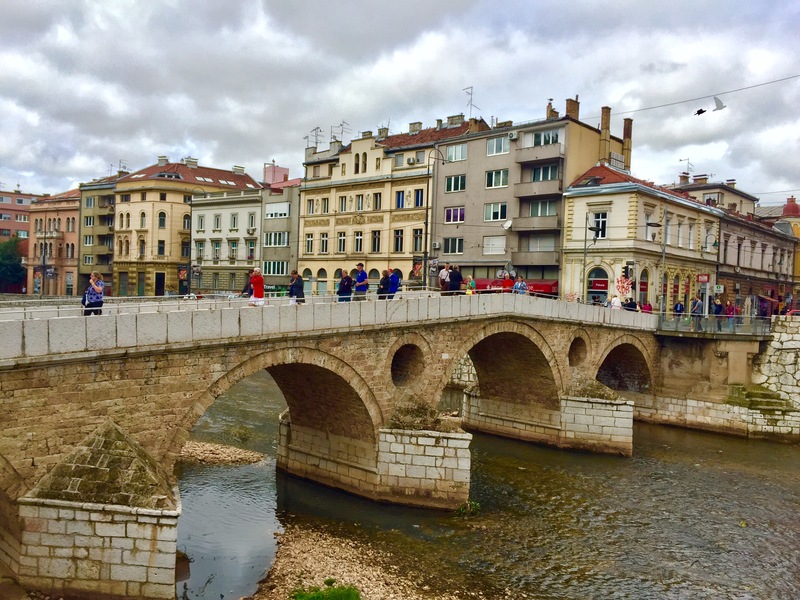 The Latin Bridge – the site of the assassination of Archduke Franz Ferdinand of Austria by Gavrilo Princip in 1914, which triggered a set of events that started the World War I. A plaque placed at one end of the bridge marks the the exact location of the assassination. Like many bridges around the world, the latin bridge is also festooned with love locks. A Coppersmith in Sarajevo’s Baščaršija (meaning, central market), mends bags to make additional money. 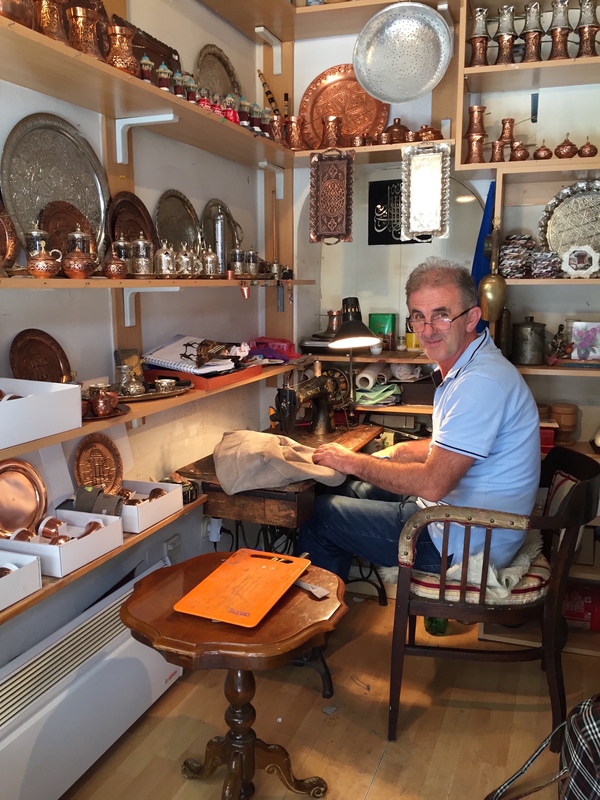 The Ottoman craftsmen brought the copper craft to Sarajevo. The skill is passed down generations and carried forth until today. The city’s enterprising coppersmiths have made pens, vases and other souvenirs from the bullets that rained down the city during the Bosnian war. Bosnia is a mix of the old and the new. Modern cafes and cocktail bars are starkly juxtaposed with traditional Bosnian coffee houses, bakeries, and restaurants. 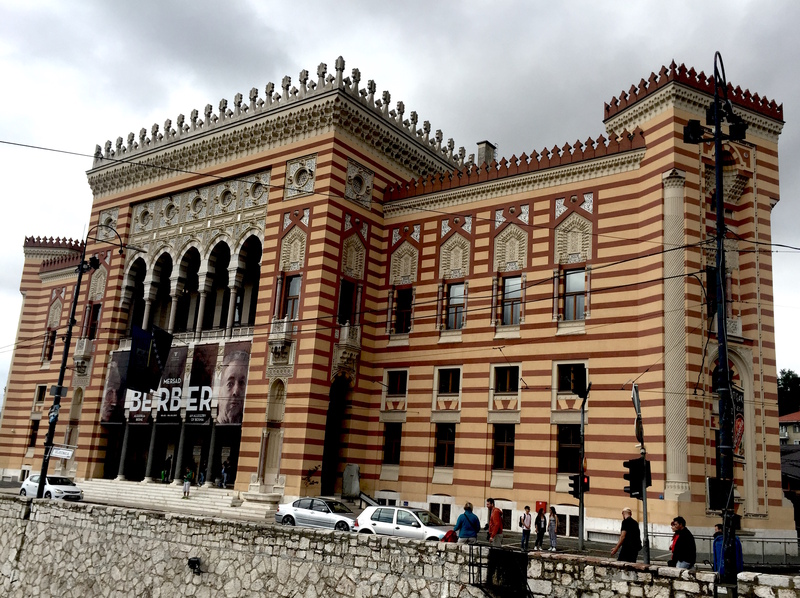 Vijećnica, the City Hall in Sarajevo, housed the national library of Bosnia. During the siege of Sarajevo, the Serb army destroyed many volumes of rare books and manuscripts. The city has rebuilt and renovated the building in many stages and finally reopened the city hall in 2014 as a national monument. 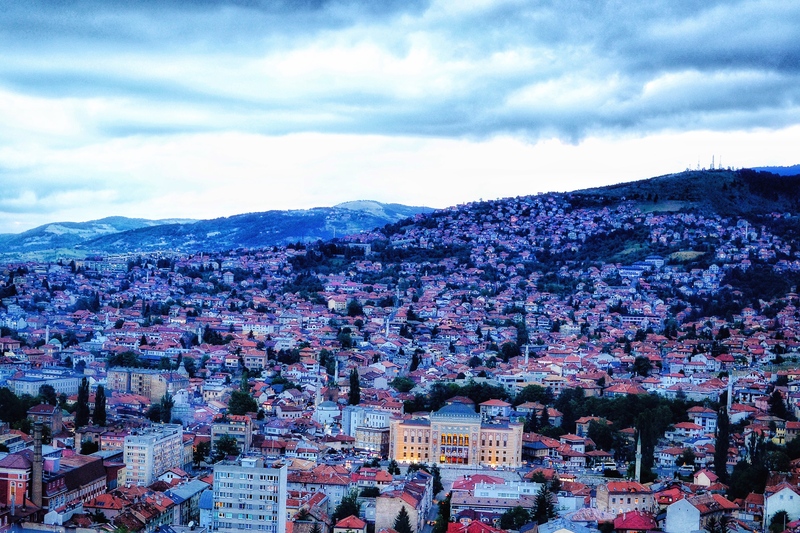 An overview of Sarajevo and the surrounding mountains from the restaurant, Park Prinčeva. Jasmin Ćuso, a soldier, conscripted in the Bosnian war, is an interior designer by profession. He shares his feelings about the war, the days of the siege, the pain, the loss, the deprivation and finally, the peace. 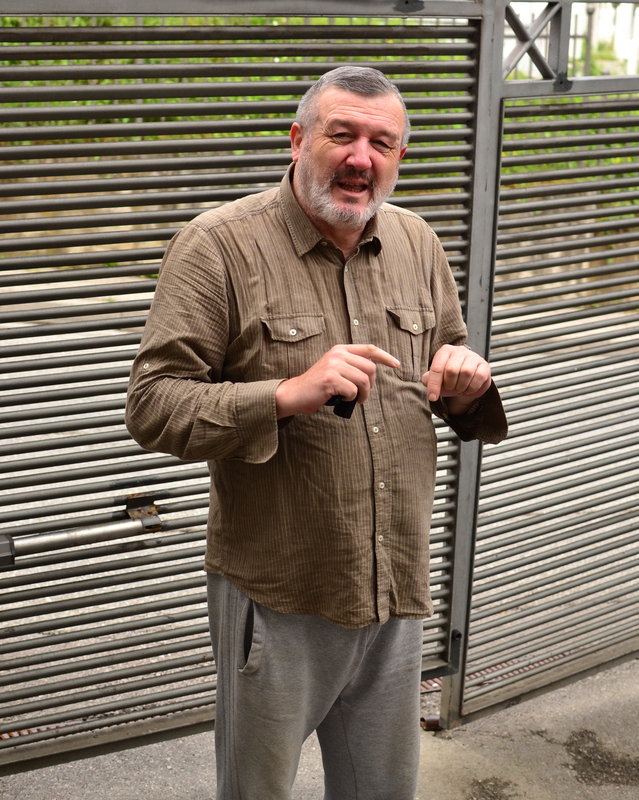 He says Bosnians are a multiethnic people who are happy to move forward and live together. The Sarajevo Roses are memorials for the victims of the Sarajevo Siege. 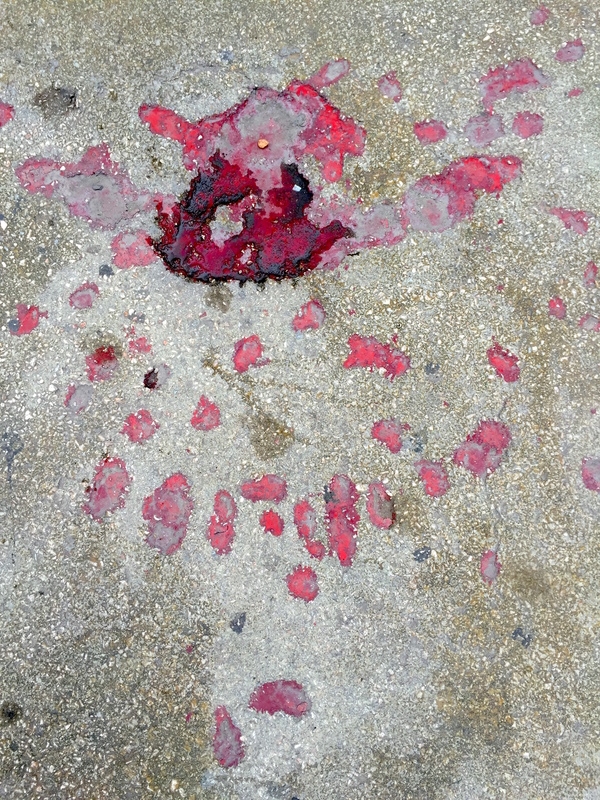 They are shelling craters on the streets that have been painted red to resemble roses artistically. They are found all over the city and mark spots where three or more people died. Visible bullet marks in the facade of a family home. In and around Sarajevo, it is quite common to see buildings (both private and state-owned) ridden with bullet holes and shell craters. 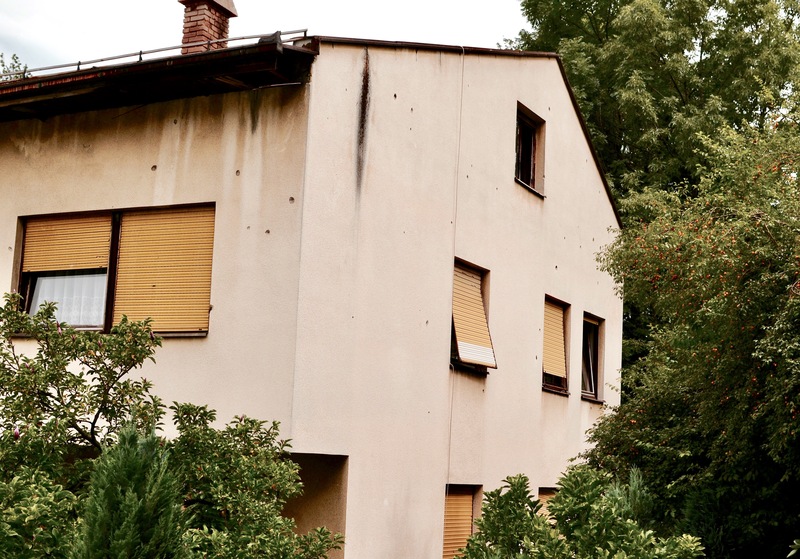 The scars from the war that lasted three years are visible in many places across Sarajevo but most prominent in the houses of ordinary people. 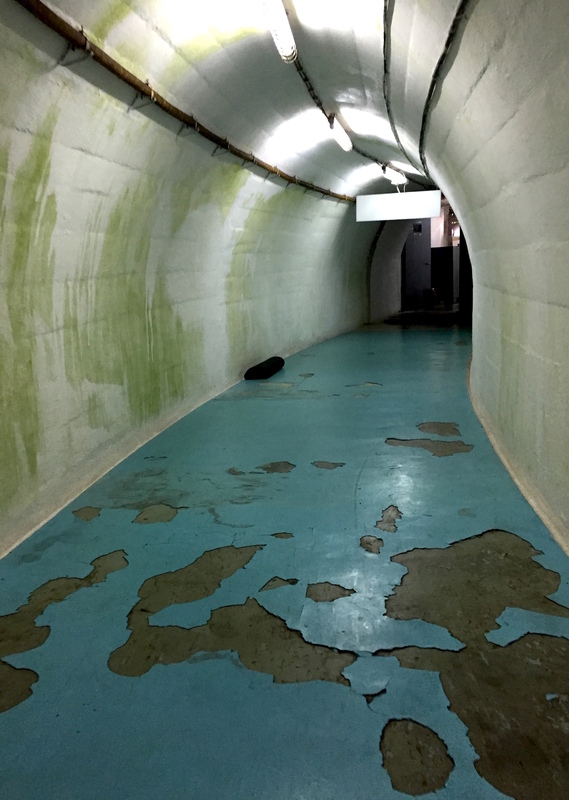 Of the many places in Bosnia that takes a visitor back in time, the nuclear bunker built in the 1950s by the former Yugoslavian leader, Marshal Tito, is remarkable. It was both ahead of its time and a considerable investment in infrastructure too. The bunker is open to visitors. 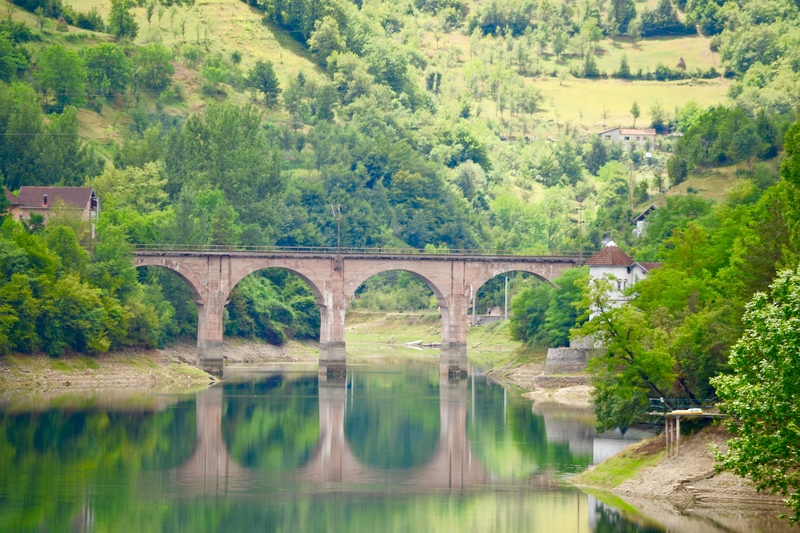 Situated near the city of Konjic, it was built to house over 300 people for over six months. Codenamed ‘Istanbul’ this nuclear shelter was Yugoslavia’s best kept military secret! A diver is standing on the Stari Most (meaning, Old bridge), a 16th-century Ottoman bridge in Mostar that was destroyed in the war and later rebuilt. 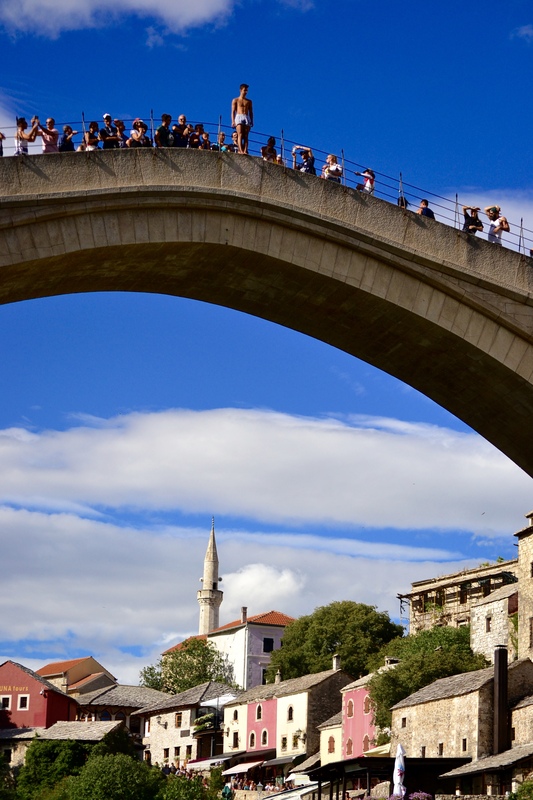 The bridge is Mostar’s epicenter. The bridge is symbolic of the bond between people of different cultures and faiths. A star attraction in Mostar are divers jumping off from the 24-meter tall bridge straight into the Neretva river below it. An annual diving competition is held every summer. 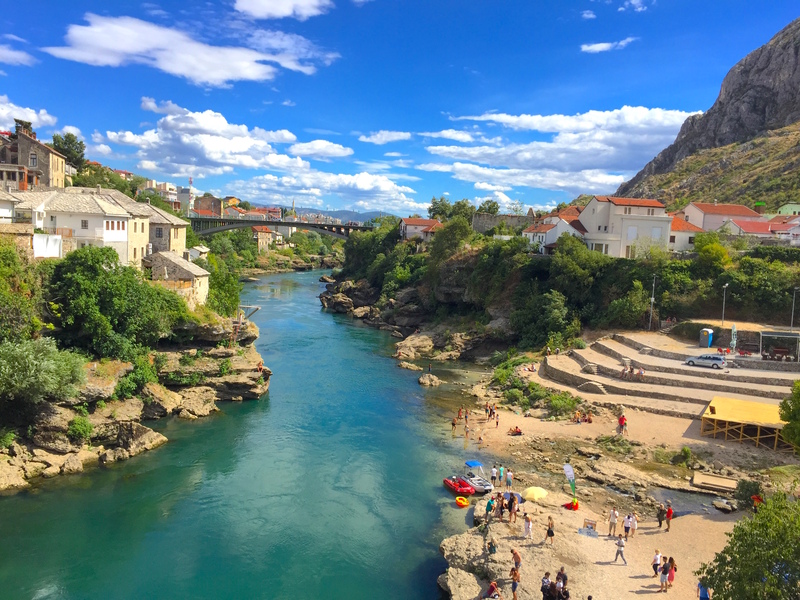 With the bridge as its epicenter, the city of Mostar flourishes in the summer months with many related sporting activities. 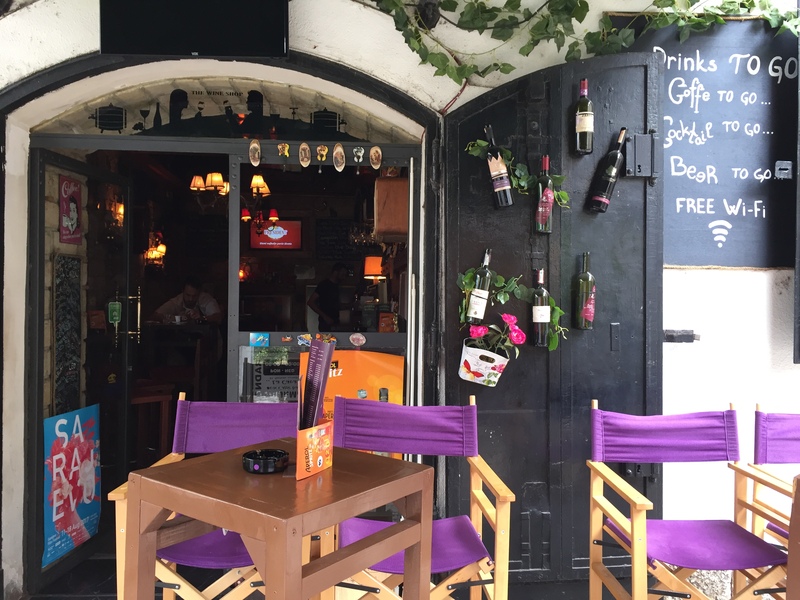 A myriad of restaurants and souvenir shops dot the empty spaces around the Stari Most to cater to the throngs of visitors. Employment in Mostar, as in many parts of the Balkans, is seasonal. The locals cash in on the tourists in the summer months and live off the earnings in the winter months. 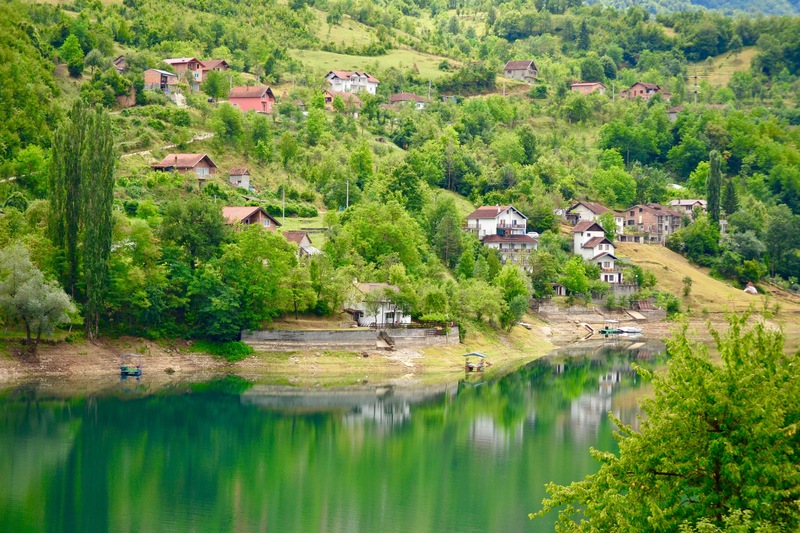 A rugged and verdant Bosnian countryside. The constellation of rolling mountains, turquoise lakes, tranquil villages with gentle people all over this country beguiles the fact that it was recently devastated by war. At Blagaj.